The Grand Junction Canal runs near our house linking the Grand Union (Brentford to Birmingham) with the Thames in the Pool of London. It is over 200 years old. Soldiers were ferried south on it for the Napoleonic wars. Produce and coal were taken to London and reuse removed thence by canal. 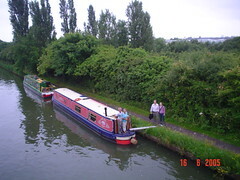 The narrow boat belongs to an aunt and uncle of my son in law. They live on it in summer.